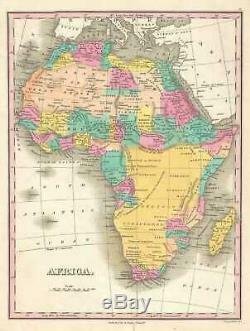 1828 Finley Map of Africa. WE SELL ONLY ORIGINAL ANTIQUE MAPS - NOT REPRODUCTIONS. Description: This is an 1828 Anthony Finley map of Africa that predates the mid-19th century explosion of European exploration of Africa. The map depicts the entire continent from the Atlantic Ocean to the Horn of Africa and from continental Europe to the Cape of Good Hope. As is common with maps of Africa, large regions of the continent are left blank, known only for being'unexplored'. Also, speculative cartography is prevalent. The Ptolemaic Mountains of the Moon are drawn stretching across the central part of Africa, with the suggestion that they are the source of several branches of the Nile. The Niger River is not immune to speculation either, with several possible courses for the river illustrated here, including one where the Niger joins the Nile, another that depicts the Niger flowing south from the Mountains of the Moon into the Congo, and even a third, which, correctly, bends southwards to empty into the Bight of Biafra. Numerous African tribes are identified throughout the map, including the Pomba, Jaga, Tbook, Tuareg, Tibboos, and Bambara. This, of course, is not an exhaustive list. An area in Mozambique is also labeled as being inhabited by cannibals. This map was engraved by Young and Delleker for the 1828 edition of Anthony Finley's General Atlas. Size: Printed area measures 12 inches high by 9 inches wide. If your address is a P. Duty varies by country and we cannot predict the amount you will be charged. Some countries are duty free, others are not. Other Services Conservation Framing: Geographicus recommends basic conservation framing services for any antique paper. We do not offer this service. The item "1828 Finley Map of Africa" is in sale since Thursday, March 14, 2019. This item is in the category "Antiques\Maps, Atlases & Globes\Africa Maps". The seller is "geographicusmaps" and is located in 11221. This item can be shipped worldwide.